Pope Francis has laicised two retired Chilean bishops in what the Vatican said was “a consequence for demonstrated abuse of minors.” Source: NCR Online. 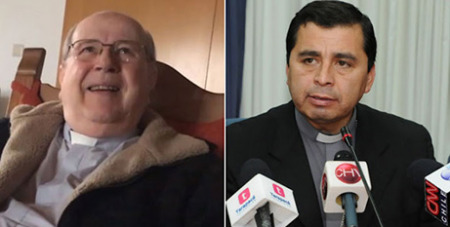 In a statement on Saturday, the Vatican announced that that both former archbishop Francisco José Cox Huneeus, 84, and former bishop Marco Antonio Órdenes Fernández, 53, will have no possibility for appeal. News of the defrocking of the former prelates came hours after Francis had met at the apostolic palace with Chilean President Sebastián Piñera. In a brief statement summarising their conversation, the Vatican said the two had discussed “the painful scourge of abuse of minors”. Former archbishop Cox is a former Vatican official and member of the Schonstatt Fathers who led the archdiocese of La Serena from 1990-1997. His institute had announced earlier this month that he had been accused of sexually abusing someone in 2004. Former bishop Órdenes, led the diocese of Iquique from 2006-13, when he resigned after being accused of having a sexual relationship with at least one minor. Meanwhile, Pope Francis accepted the resignation of Washington’s Cardinal Donald Wuerl on Friday, CNA reports. Francis has asked Cardinal Wuerl to continue leading the archdiocese on an interim basis until a permanent successor is appointed. The cardinal has been the subject of criticism since late June, when revelations about alleged sexual misconduct on the part of his predecessor, Archbishop Theodore McCarrick, raised questions about what Cardinal Wuerl knew about Archbishop McCarrick, and how he responded to that knowledge. The August 14 release of a grand jury report detailing decades of abuse allegations in six Pennsylvania dioceses also put under close scrutiny Cardinal Wuerl’s record as Bishop of Pittsburgh, where he served from 1988 to 2006. Some cases in the report raised concerns that Cardinal Wuerl had allowed priests accused of abuse to remain in ministry after allegations had been made against them. In the letter accepting Cardinal Wuerl’s resignation, Pope Francis defended the cardinal from the widespread criticism he has faced in recent months. “You have sufficient elements to ‘justify’ your actions and distinguish between what it means to cover up crimes or not to deal with problems, and to commit some mistakes.